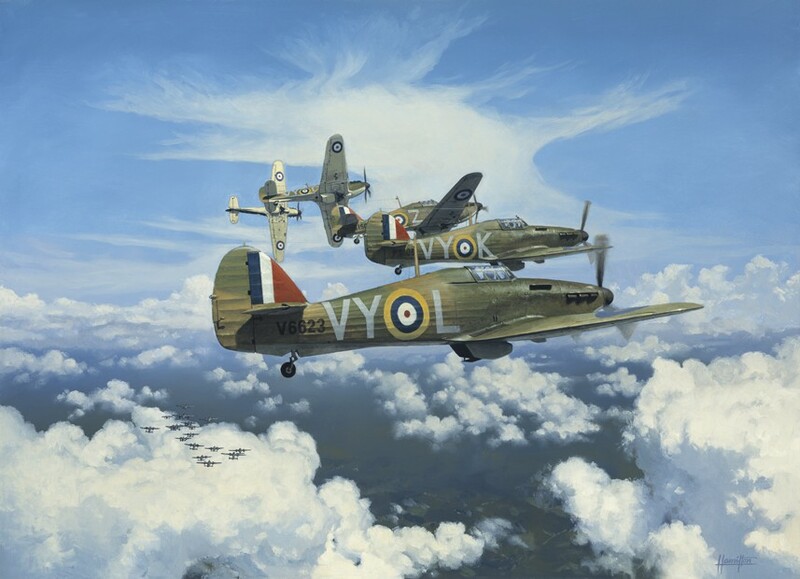 The idea for this painting came from reading about a senior pilot of 85 Sqn. Flt. Lt. H.R.Hamilton, a Canadian from New Brunswick. The Surname of Hamilton of course caught my eye, and I learnt that he had been shot down and killed near Camber Castle, Sussex. Further reading showed 85 to be a squadron who were in the thick of the fighting for much of the time. Therefore, I decided to paint a section of 85 Sqn. Hurricanes with "Hammy" Hamilton's VY-L in the foreground, the aircraft in which he was to lose his life. He died on the evening of 29th August 1940, aged 23.